The power of brutal winter has been felt everywhere, it seems. Here in the heartland of the U.S., actual temperatures reached -37 degrees Fahrenheit, with windchill factors as low as -55. Unfortunately, the barrage was not a one-day phenomenon but an extended period of bitterness. It all began as a rather typical shift in the climate, not at all unusual for this latitude. Many even showed an exuberance for the change, moving outdoors with their pent-up energies in an open display of their unwillingness to cower before the inclemency of such frigid temperaments. Often there is resolve to be found in collective survival against a common foe like the icy dispassion of hard winter. We grow in the belief that we can withstand it, together, and we draw energy from it. But we were reminded daily of the threat to life and health if we did not heed the warnings to remain inside and avoid confronting the cold. Travel was not only not advised, but barricades were put up on some main thoroughfares so that rescue of those who attempted flight to more hospitable areas would not become necessary. Some citizens were actually arrested for venturing out to places where they had been forbidden to be. Sadly, deaths occurred, in addition to many injuries. We have experienced dangerously cold moments in the past, but this one seemed more threatening, somehow. Some people suggest that the advent of cell phone and social media technology contributed to the deeper feeling of danger. Instant reporting of cold, and deaths resulting from it, accompanied by photos of people with frostbite injuries, amplified the seriousness of the cold. We were able to learn of each new impact from the cold front as it happened, making the onslaught feel more continuously brutal than we might otherwise have felt. We watched video footage of brave demonstrations where the astonishing effects of the cold front were shown: have you ever seen a pot of boiling water immediately vaporized by the severe cold? Those activities made for indelible images about just how cold it had become. Most schools closed, and remained closed, with parents too nervous to send their children outside and schools recognizing the danger to their pupils and teachers alike. Even the colleges and universities were forced to shut down, in fear for the safety of the students and professors. When our most venerable institutions were forced to take such action, we knew that the severity of the front was real, and that resolutions of standing up to frigid conditions must yield to the realities of real danger. There have been serious economic costs to the deep freeze. Of course, tourism always takes a hit when the climate isn’t friendly. It’s uncertain how many people chose to stay away from the harsh conditions. And this is normally a destination which people frequently visit for its beauty and warmth! But shops and commerce came to a standstill in the face of the blasts, suffering losses that are not likely to be made up soon. It’s unclear what the remainder of the winter might be like. Some forecasts suggest that an early thaw could occur and that we all might return to some degree of normalcy. Others are convinced that this polar vortex is likely to be a more frequent presence in our lives; prior to last year, I had never even heard of it, but during 2018 and to the present it has certainly become a familiar condition. The entire experience underscores everyone’s necessity for having protective layers against the winds…. Eve left the Garden of Eden over chocolate! Anonymous. The exodus of the people of Israel from Egypt to the Promised Land, the Bible says, had a decisive moment when, pursued by Pharaoh and his Army, they arrived desperately to the sea, and then Moises raised his staff and the sea opened up; so they turned a page and wrote their history. The chocolate industry predicted that by 2020 they will need 30% more chocolate; nevertheless, the cacao supply does not seem to be responding to the demand. Said figuratively, the state institutions, the market and society, like Moises, are raising the staff of productivity, quality, inclusive businesses and fair trade so that there might be more cacao and Eve might have a reason to not go back to Eden, but the sea is not opening up! Why? What “staff” is needed for the sea to open? This article deals with that question. René (rmvidaurre@gmail.com) has a PhD in development studies, is a collaborator of the Winds of Peace Foundation (http://peacewinds.org/research/), an associate researcher of IOB-Antwerp University (Belgium) and a member of the COSERPROSS Cooperative RL. We note that the name of the municipality “Sasha”, the Dalila cooperative, the ABC and RDA NGO, Flesh company, and the last names Konrad, Peñaranda and Peña, mentioned in this article, are ficticious. We did this to protect those identities from any inconvenience that this article might cause them. I recently took the opportunity to travel to some places I had never been before. Specifically, my wife and I visited for the first time the jewels of the Southwest United States: Grand Canyon, Zion, Bryce Canyon, Capitol Reef, Canyonlands and Arches National Parks. Such an experience is many things: renewing, educational, inspiring, humbling, a privilege and even existential in nature. Especially at this time of great upheaval within our country, the opportunity to “pull back,” even for a short time, provided a welcome relief. And an important lesson. The sign is simply a reminder of the transience of these landscapes and our impacts upon them. They are fragile. People too often have the desire to leave their own imprints on these monuments of creation, as if to satisfy a need to make a statement of existence, to leave their own modern-day petroglyphs about which future visitors might wonder. Perhaps it was the reflective nature of our trip or my tendency to look for hidden meanings where none may be intended, but the words on the sign prompted other thoughts for me. Our steps do matter, whether for the health of ground vegetation, rock formations or water quality in the parks. Trees that have withstood the extremes of nature for more than 100 years are nonetheless dependent upon “breathing space” from the hordes of human visitors who come to these sites constantly to witness the immense majesty of the natural world. It’s among the places where it’s not OK to take “the road less traveled,” as Frost suggested, and where we’re discouraged to blaze our own trails, in deference to the survival of other life. In light of the signage, I felt a certain pride at keeping to the paths, as though I was contributing something good to the welfare and sustainability of the parks. I know that the notion is ridiculous, but staying on the trails was perhaps the one act of preservation that I could make. But that same sense of self-righteousness led me to consider other steps in my life. Steps everywhere in our lives matter. Every stride taken in our journey makes an imprint, leaves a trace, impacts our surroundings. Like the proverbial beating of butterfly wings that affects weather patterns on the other side of the world, we are part of a global tapestry wherein all of us are inextricably dependent upon and impacted by each other. 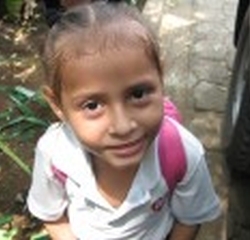 Choices we make in the U.S. have an impact in Nicaragua. We might elect to trespass over someone else’s space, and might even be able to “get away with it,” and to do so without detection. But the space will be changed forever, in ways that we may never know. How and where we walk are matters of choice: we can elect to tread lightly and with respect, or to trample according to our own narrow wills. Either way, we leave a story for those who follow. Like our children. Or our grandchildren. Or our children’s children’s children. Our steps are our legacies, like those artifacts we covet from millennia past. They are the messages we leave behind that attempt to declare our existence and portray the kinds of lives we led. What a pity if, in our wakes, all that remains are traces of once-resplendent times and places…. With an open treasure, even the most righteous sins. Saying. The VII song of the Odyessy tells how the goddess Circe warned Ulysses that the sailors of those waters were so enchanted by the song of the sirens that they went mad and lost control of their ships. To not succumb to that enchantment, Ulysses asked that he be tied to the mast of the ship, and that the oarsmen have wax put in their ears, and ordered that if he, because of the spell of their song, would ask that they free him, instead they should tighten the knots. So it was that Ulysses and his oarsmen were saved, and the sirens, failing in their objective, threw themselves off the cliff. Facing unfair commercial relations, Fair Trade (FT) emerged as an alternative so that people who organized might improve their lives and be a space of solidarity among different actors beyond their countries´ borders. Nevertheless, the institutional structure of the power relationships under the market rule of elites is like the sirens of the myth, capable of seducing the FT network, of turning it against its own principles, and turning solidarity into just a bunch of words, numbers and papers. How can FT tie itself up to not succumb to the song of the sirens, and in this way, grow, enhancing its FT alternative principles? To respond to this question, we take as given that there are exceptional cooperatives, organizations, and people who confirm the importance of organizing and cultivating global solidarity, and that there are still more successful cooperatives, in countries in the south as well as in the north, in FT as well as outside of it. Nevertheless, in this article we study certain practices of the FT framework that seem to indicate its regression, and on that basis we suggest that FT re-invent itself. To do so we focus on coffee, which constitutes 70% of the volume of what is sold through FT. It should be noted here that this analysis does not presume that all parties in the FT framework will view its conclusions with favor or agreement; indeed, some of the actors within the FT arena are very well-served by the current status of the FT mechanisms. Nor does the author attempt to provide a blueprint for all of the actions necessary to cultivate change. The intention herein is to describe the realities of the FT network as it most often operates, and to draw attention to the ways it could be returned to its original objectives and principles. Even though strictly speaking currently FT is the organization known as FLO International (Fairtrade Labelling Organization International) and FT-USA (FT-United States), we call “the FT network” the series of cooperatives, certifiers, social banks and buyers who operate under the FT seal. We have followed the topic of fair trade in coffee since 1996 (See: Mendoza 1996, 2003, 2012a and 2012b; Mendoza & Bastiaensen, 2002). The Paris agreements on climate change: A path for saving the planet? When the waves of the ocean hit our chest, at the same time we feel a current of water pulling our feet in the opposite direction. In the midst of pressures from all sides, on December 12, 2015 representatives of 195 countries meeting in Paris achieved the first universal and binding agreement for saving the planet. In this article we argue that the Paris Accords are like the “waves” that allow us to surf, but we need to discern “the current under the waves”, the undercurrent that could drown us. To do so we start with a brief theoretical framework, then we identify the problem of climate change, we put it in a historical perspective, we list the agreements achieved in Paris and their long term effects, we discern “the current under the waves” of the agreement, we measure the challenges, and putting ourselves on the side of peasant, indigenous and Afrodescendent organizations, we suggest concrete mechanisms for the mitigation of climate change. There is a close relationship between common goods (collective or public goods) and climate change; the atmosphere is a good that belongs to everyone, and at the same time it is limited, it can be exploited and really has been excessively exploited (pollution). The question is, if we know that the climate benefits all of us, why is the atmosphere polluted? Hardin (1968), in a Cold war context marked by the state-market economy dichotomy, argued that rational individuals, maximizing their private advantages and socializing their costs, use up common resources, which is why they are condemned to be used up (privatized) – this is where the phrase tragedy of the commons comes from. The dilemma is that we all want a non-polluted atmoshpere, but our individual rational actions cause irrational collective results, climate change. Olson (1965) recognizes the cause of this dilemma in the free rider, the opportunist who thinks that he will receive benefits regardless of his contribution, which results in a generalized assumption. Olson suggests working in small groups and providing sanction/incentive mechanisms in order to save the commons. Ostrom criticizes Hardin because of the deterministic nature of his theory (“tragedy”) blocking human progress, and on the basis of cases of communal management, finds that the commons do not disappear, that they can be well managed if there is clarity about the rules (laws), the collective methods, and if decisions are made collectively, there are local and public conflict resolution mechanisms, including sanctions on those who violate the rules, and when the self determination of communities is recognized by the authorities at the highest level. In this case there is no “tragedy”; cultures understand that the commons are environments that make sustainable and rational behavior possible (De Biase, 2014). Resolving this dilemma of collective action requires knowledge, particularly in the case that concerns us. Nevertheless here another dilemma emerges, science generates information that causes uncertainty, yet at the same time we depend on that information. Following Beck (1986), we live in a society of risk (“modern society”), not just of classes (“traditional society”); our medium is an environment where knowledge, like being, determines awareness, whose formation is different to awareness previously, because the dangers are not coming from the rich and poor, but both face the same problem in this society of risk, even though with differential results – like an earthquake of the same scale has different effects in Haiti than in the United States. Science reports on the increase in temperature and suggests its control, even some express their faith that progress in technology will solve climate change; but science cannot predict the consequences of that increase because of the its degree of complexity. The paradox is that there is uncertainty about the knowledge, while at the same time we depend on it (Beck, 1986). Both dilemmas, the collective action and the knowledge dilemma, move under structural conditions, which are ideas, interests and organizational patterns and institutions founded over centuries, that are very exclusive and generally dominated by small elites. Within this framework we formulate a number of theses: there are structures that underlie the contamination of the atmosphere and the primacy of individual rationality, which has had perverse effects; the commons (the atmosphere), following Ostrom, are not “tragedy”, but conflicts that should be analyzed as starting points from a political economy perspective; the dilemma of collective action and the uncertainty can be resolved through a knowledge produced by “epistemic communities” that would include the “civil scientists” (vulnerable families and their organizations) and “natural and social scientists”. What does it imply? Solar energy passes through the atmosphere, part of that energy is absorbed by the earth´s surface, and another part is reflected (bounces back); part of this reflected radiation is retained by greenhouse gases (GHG), and another part returns to space. In other words, GHG are in the atmosphere, they retain part of the heat of the sun, and within a certain range, maintain a temperature appropriate for life. The problem is when these GHG increase in the atmosphere, retain more heat and make the temperature of the earth increase. If we take the average world temperature of the preindustrial period as a reference point (see Graph 1), the temperature for 2012 rose by 0.85 degrees Celsius (known as centigrade, symbol C ) compared to the preindustrial period; if this increase continues without any change, the temperature for 2100 will increase by 4.0 0C, a situation in which it is believed that the planet will survive, but not the human race. The G-7 countries have promised zero emissions of carbon by that same year, 2100; the question could be asked whether they are sure about that, because there would be no human beings capable of emiting it. In the Paris Accords achieved in December 2015, the parties (countries) proposed new commitments to stay under a 20C increase over the preindustrial level. Nevertheless, even if the accords are fulfilled, the spending of the carbon budget will not only reach 107.3% in 2080 (see Graph 3), but a 2.7 0C increase will be reached, something recognized in the Accords themsevles: “Observes with concern that the estimated levels of the added greenhouse gas emissions in 2025 and 2030 resulting from the foreseen contributions determined at the national level are not compatible with the scenarios of the lower cost 2 ºC, but rather lead to a projected level of 55 gigatons in 2030, and also observes that, in order to maintain the increase of average world temperature under 2 ºC over preindustrial levels, through a reduction of emissions to 40 gigatons …” (chap 2, art. 17). We talk about a carbon budget, because the quantity of carbon to be emitted to not go beyond the 2 0C of (average) global warming has been established. Graph 2 shows how we have been spending that carbon budget, displaying the danger of the “undertow.” Between 1860 and 1965 a fourth of that budget (24.4%) was spent (emitted), spending that by the year 2000 was already half of that budget (53%), and by 2012 nearly three fourths of the budget was spent (67.1%). 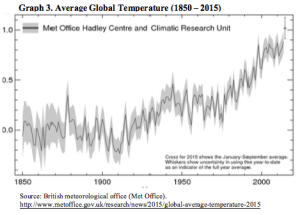 This is what Graph 1 shows as 0.85 0C of global warming. Then, Graph 3 provides us another important figure, that in November 2015 global warming went beyond the “ceiling” of 1 0C over preindustrial levels. From this we see the spending of the carbon budget is happening more and more quickly, consequently the increase in global warming is also happening more quickly. The problem, according to the IPCC (International Panel on Climate Change, Stockholm 26-8-2013) is that when the temperature gets beyond 1.6+ y 2.0+, that temperature will remain there for hundreds of years, no matter what we do. This threshold, at the pace we are going, will be passed in a few years. By 2033 we will have spent 100% of the carbon budget, and global warming will rise 2 0C, and by the year 2100 it will have risen 4 0C. Let us remember that these data are a world average, which means that the increase of 2 0C over preindustrial levels, in tropical regions could be 3 0C or more, which will be catastrophic for life – the earth and humanity. With a 2 0C warming it is thought that, among other consequences, parts of the world will be uninhabitable, there will be worse droughts and floods, strong storms, risks that coastal areas will flood, decrease in rivers, expansion of deserts, acidification of oceans and cities affected, food insecurity because of the decrease in yields of harvests and because of the loss of habitat from flooding, collapse of the marine food chain, loss of biodiversity, and according to Burke et al (2015), the increase in temperature will widen even more inequality gap. These are some of the foreseeable consequences, but in general, uncertainty prevails about the effects of climate change, and the accompanying risk that we under or over estimate them. In other words, averages are deceptive; understanding climate change is understanding the enormous diversity in the production of the problem, and in the fact that its effects are suffered in a differentiated manner; the diversity and inequality that it expresses clearly are not solved with charity. In becoming aware of the gravity of the climate change situation (or global warming) that threatens human existence itself, we ask ourselves about how we have gotten to this point. The key is in the increase in GHG caused by human actions. This began in the XIX century with the industrial revolution, first with the European countries, and later including other countries – here we find the largest free riders in the world. Table 1 shows the 14 countries that have emitted the most carbon dioxide (CO2) into the atmosphere in different historical periods. Between 1865 and 1890 the countries of Europe (in blue), were the countries that most polluted the atmosphere. Since 1890 the United States appears as the biggest polluting country. 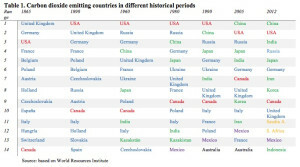 Then, between 1960 and 1980 four Asian countries joined the group of the biggest emitters of CO2. And between 1990 and 2012 there is a more diverse and globalized table of 14 countries that have polluted the most; China starting in 2005 takes the lead as the most polluting country. that together emitted 31%. Finally there is the rest of the world (158 countries) with 17% of total CO2. This data, nevertheless, hides the complex global interaction that exists among countries, the flows and outsourcing of pollution. For example, the countries of Europe and the United States, to reduce their gas emissions, use components of solar energy panels and wind turbines made in China. Countries like England, to avoid fines from the European Union that set goals for recycling, and due to the fact that the prices of plastic and paper dropped, transfer recyclable waste to Indonesia. Or countries like China, that import wood from Latin America for the construction of a large amount of homes in times of strong economic growth. Nor does the flow from large corporation appear in the data, that move to other countries to export from there the products that their countries need. In this way, countries like China and Indonesia appear to have higher CO2 emissions, while countries like England appear to have less. 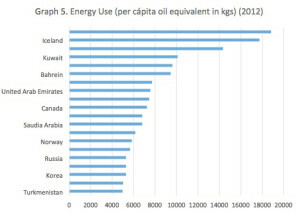 In addition to the recognition of the production and consumption chains between different countries, a view of the use of per capita energy also influences the interpretation of the pollution list. For that purpose we focus on year 2013, and we analyze the six highest polluter countries in the world. See Table 2. Total energy consumption is expressed in kilotons (1000 metric tons) of fuel used (related to oil, natural gas and solids like coal); and the emission of CO2 includes the burning of fossil fuels, manufacturing of cement, and the carbon dioxide produced by the consumption of natural gas and coal. From Table 2 we see that between China, United States, India and Russia they consume half of the energy generated on the planet, (50.3%), and are responsible for half of world emissions of CO2 (52.1%), but at the same time they are countries that have 43.1% of world population. The United States shows the greatest imbalance by consuming 17.2% of energy and emitting 16.2% of total CO2, when it has only 4.4% of world population, which shows conclusively that the USA as a country, and in per capita terms, is the most polluting country of all – the leader of the free riders. We present two graphs in what follows that deal with energy consumption and per capita emission of CO2, that should be interpreted with a certain degree of care. 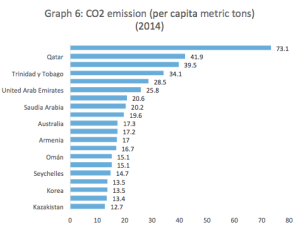 For primary energy consumption before its transformation into final fuels (equal to national production plus imports and variation in stocks, minus exports and fuel supplied to ships and planes affected by international transportation, see Graph 5), six Arab countries are among the biggest pollutors (Qatar, Kuwait, Brunei, Bahrein, Omán and United Arab Emirates). 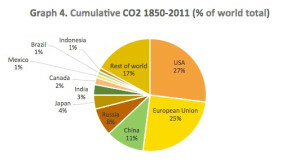 Pickety (2015), with data on the historical tendencies of per capita CO2 emissions on the national level based on consumption, confirms that global emissions are concentrated: 10% of global emitters (from all continents) supply 45% of global emissions, and the 50% of those that emit less, supply 13% of global emissions. To complement this description of pollution, we show its sources also by sector (see Graph 7). The greatest source of contamination is the production of energy (44%) that includes the use of electricity, industrial use of energy and other sources related to energy; followed by agriculture and deforestation (26%); then industrial processes and waste, and burning of fuel in homes and businesses (16%); and transportation (14%). And given that agriculture interests us because of its historical importance in the world, particularly in Latin America, I include Graph 8. Of total contamination generated by agriculture, 36% comes from nitrogen oxide (N2O), 14% from CO2 and 50% from methane (CH4). 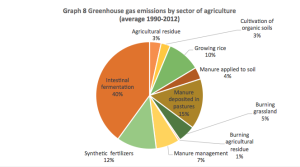 Of this 100%, now looking at the Graph, the biggest contamination comes from ranching: 40% from intestinal fermentation (digestion of organic material by livestock) and 15% from manure deposited in pastures. Summarizing what we have seen so far, global warming has happened because of the increase of GHG, an increase that has been mostly due to the generation of CO2 (in addition to methane and nitrogen oxide) in which the United States and Europe cumulatively have emitted 52% of CO2. Six countries have done the most contamination in absolute and relative terms. Highlighted as well are the strategies of some countries to appear as less polluting. The case of the Arab countries, with a high per capita consumption because of their production of cheap fuel, is a unique case due to being confronted with the dilemma of helping to save the planet (leaving fossil fuels underground) and their survival due to their dependency on oil. Finally, the contamination by sector shows agriculture and the forestry sector with not very high percentages -14 and 12% respectively – but they are very important sectors because: most of the impoverished part of the population is concentrated there; they are the only sectors with the potential to absorb GHG from the atmosphere; and because agriculture is a sector that can make the greatest contribution to the mitigation of climate change (Reynolds, 2013), like the forestry sector. This is ratified by the experience of Brazil, a country that reduced deforestation by 70% in the Amazon between 2005 and 2013, and with that has had a direct effect on global level emissions. Without this contribution Graph 7 would be different and the spending of the carbon budget would be greater for 2012 in Graph 2. In conclusion, agriculture is another case that shows the importance of diversity, and that tells us that poverty and inequality can be solved if agriculture and forestry effectively contribute, with innovative practices and institutionality, to absorbing GHG. 196 members (195 countries and the European Union) arrived at a “legally binding” accord, that will be ratified in April 2016 and will take effect in 2020. The key words of the agreement are: mitigation, adaptation, financing, technology and building capacities. The principal objective of the accords is; keeping the increase of global temperature below 2 0C over preindustrial levels, “and continue striving to limit the temperature increase to 1.5 0C”. To do so, 162 countries have turned in their sheet of the route called “Intended Nationally Determined Contributions” (INDC) to limit the effects of the increase in temperature, while 9 countries, among them Nicaragua, did not turn in their INDC, and other countries, like Bolivia, turned in their INDC on the condition of foreign financing; they agreed to mobilize 100 billion dollars annually from the developed countries for the developing countries as a financing mechanism for climate change mitigation and adaptation measures; and they agreed on support for research, development and demonstration of technology, and the development and improvement of endogenous capacities and technologies. 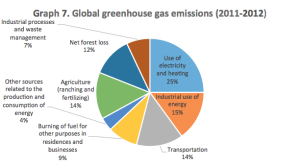 The areas prioritized for the reduction of greenhouse gases are renewable energy, energy efficiency, transportation, methane and agriculture, and the foresty sector. The noise generated around the Paris Accord is one of triumphalism, but the reality appears to be bleaker. Let us remember that the issue of climate change was already discussed in the Rio Earth Summit in 1992, an event in which the treaties on the United Nations Framework Convention on Climate Change (UNFCCC), on Biological Diversity, and the Convention to Combat Desertification became known. Let us note that by 1990 we had already spent 43.4% of the carbon budget, and by 2012 we had spent 67.1%; if governments had decided to fight climate change in 1992, the situation today would be very different. Even 1.5 0C would have been achieved if there had been an agreement at the first United Nations Conference in Berlin in 1995, while now it is only “an aspiration and improbable goal” (Monbiot, 2015). 23 years after the Rio Summit and 20 years after the Berlin Conference, and after global warming doubled from what it was in 1990, implementing the Paris Accords will only make the increase in global warming happen more slowly, and that it not continue beyond 2080. Worse yet, these accords are only going to be applied starting in 2020! Some additional thoughts. First, in fulfilling these accords, pollution will continue and the spending of that budget will reach 107.3% by 2080 (Graph 2), the year in which the situation will improve, and in the year 2200 the spending of the carbon budget will be 95.8%, a level much higher than the present level! Secondly, the Paris Accords warn that the INDCs sent in by the countries imply aggregate greenhouse gas emissions that go beyond the 2 0C and “lead to a projected level of 55 gigatons in 2030”, while the goal is 40 gigatons, “to keep the increase of average world temperature under the 2 0C” over preindustrial levels; the 55 gigatons imply a temperature increase of 2.7 0C expressed in Graph 1. Third, the euphoria of having arrived at a global agreement obscures the fact that even that 2 0C is an “average global temperature”, which would be greater in tropical countries, and that means that the Paris Accords are in their core a partial acceptance of that calamity. These results make J. Hansen, considered the father of global awareness of climate change for being the first scientist to sound the alarm about this problem in 1988, describe the Paris Accords as a “fraud”, and a “falsehood” (Milman, 2015). Why? Hansen argues that the accords are only “promises without actions”, that until taxes (or charges) are placed on gas emissions, climate change will get worse. In a more moderate way, Monbiot (2015) says that the Paris Accord, compared to what happened in Copenhagen 2009 where no agreements were reached, and seen from the “narrow framework” of the United Nations, are “a miracle”; while seen from outside that United Nations framework, from what they should be, “are a disaster”. Why is it so difficult to reach an agreement to save the planet? It is the dilemma of collective action. From the data seen, the accords depend in large measure on the fact that the 10 most polluting countries, or the companies that are behind them, would cede in their positions and overcome what Hardin called the “tragedy of the commons”; that the feeling of the countries who are not on that list, in seeing that their development path by way of industrialization will tend to be limited, where the companies and their national counterparts also have a lot of influence, likewise would cede to a perspective of diversity; and from what is observed in different parts of the world, it depends also on the growing awareness and reactive, and above all proactive, social mobilization with long term thinking. The “undercurrent beneath the waves” has to do ideas and interests. Monbiot (2015) identifies a “narrow framework” within which the discussions on climate change have taken place. Verbruggen (2015) says that there is a large coalition on the climate (officials, academics, captains of industry and people in the green campaign) rooted in the belief that “there is no alternative”, and in a faith that “the only viable form is continuing the current course”, which does not seem to be appropriate in an issue like climate change, where frequent disruptions are experienced and where diverse theories, practices and technologies are needed. This “narrow framework” and “the only viable form” is the economic perspective, and that “large coalition” in reality are the technopols that Robinson (2003: 214-217) has identified in each country, who are certain intellectuals who are “charismatic, organic, politicized and local organizers of groups with a transnational orientation, that play an important role distinguising local strategies, political programs, technical plans and ideologies, for integration into the new global order”. They are actors connected to one another, nationally and internationally, that penetrate the State and promote the transnational project of capitalist globalization. Verbruggen questions why economists embrace a sole global approach (the market) in climate policy, when there have been so many failures trying to impose a “uniform straight jacket”; and accuses that perspective of having paralized climate policy since 1997 in COP03, Kyoto when the United States imposed trade in emissions. This perspective, motivated by countries´ economic interests, has led to the fact that the Paris Accords focus more on the consumption of fossil fuels and not on their production (Monbiot, 2015), and that they are promises easily avoided by countries. An example of this is England, a country that has a policy for reducing greenhouse gas emissions (reducing the demand for fossil fuels) under the 2008 Climate Change Law (coherent with the Kyoto Accords, see footnote no. 26), and another policy under the 2015 Infrastructure Law by which it urges oil and gas companies to increase their production (greater greenhouse gas emissions) to “maximize the economic recovery” of England (Monbiot, 2014); in other words, on the one hand it reduces gas emissions, and on the other it promotes the increase of their emission, and both policies are implemented under the direction of the Secretary of State for Energy and Climate Change. What is happening in England, Monbiot himself confirms, is a common practice of governments trapped by the interests of large corporations. From the side of some developing country governments, there are criticisms of the capitalist system, but without moving outside of the “narrow framework”. Correa (2015), president of Ecuador, points out that the old division of labor, countries who are producers of raw materials and countries responsible for the industrialization of those raw materials, has been replaced by another: “the rich countries generating knowledge – science, technology – that they privatize, while countries like Bolivia, Venezuela, Ecuador, countries of the Amazon basin, we generate environmental goods that they consume for free…”Correa points out that that knowledge is privatized through “patents” and “royalties”, and whose violation is penalized with jail time; while “there is no jail time if a multinational company destroys our nature”. This new division of labor, according to Correa, is based on “power”: “Who are the polluters, but produce knowledge that they privatize, and in exchange they consume environmental goods freely? They are the most powerful ones”; “there are courts for financial debt, there are courts to protect not the rights, but many time the abuse of the multinationals. Why are there not courts for something as fundamental as establishing the ecological debt—?” For his part, Evo Morales, the President of Bolivia, in the 70th General Assembly of the United Nations, said that the countries of the south are not going to be the “forest rangers of the countries of the capitalist system.” And in the very same COP21 of Paris, the representative of Nicaragua, P. Oquist said: 1) that the agreements recognize the debt of the countries historically responsible for climate change; 2) that under the principle of responsibility, they compensate the developing countries, because the consequences of climate change are suffered more by developing countries; 3) that the goal promoted by the developing countries, particularly the island states, has been 1.5 0C and not 2 0C, and that the highest polluting countries reduce their gas emissions; and 4) that the procedure for the decision of the Accords was authoritarian and not democratic. At the same time, in apparent contradiction, Correo supported oil exploitation in the Yasuni Amazon park and in other indigenous communities (Sarayaku, Kichwa, etc). The same situation is happening in the case of Bolivia, Venezuela and other countries. The discourse to the outside world does not appear to be endorsed inside the countries. This is due to three reasons. First, their environmental policies are not backed by their own resources, they are dependent on foreign resources, be they called “compensation” or “Payments for Environmental Services” (PSA), which is why they end up accepting the environmental policies governed by markets. Second, the old Taylorist model of organization persists, that shaped states, political parties, unions and guerrillas, vanguard structures, which keeps them from going out and listening to the communities, and taking their perspectives seriously, that go beyond the economy and its routes, that move outside the lines defined by the modernization theory of “development”. Third, in criticizing the absence of responsibility on the part of the developed countries, and at the same time demanding compensation, they are denying the diversity in the world that they justly tend to speak about in a discursive way. As we said before, the diversity and the inequalities are not resolved with charity. This economic logic, called by Polanyi decades earlier as the “market society”, postpones agreements and their compliance, diverts attention toward demand while it rejects leaving fuel underground, criticizes gas emissions in a country and at the same time opens the door to extractive companies. That opposition, successful since at least the Parties Conference in Berlin in 1995, allowed the Paris Accords to happen as a “consensus”. Under this logic, (economic) progress of countries has happened embedded in gas emissions; it is the idea that there is no development without industrialization; that climate change would be resolved with more economic progress (and “aid”), that it is not with less market that climate change is going to be resolved, but rather with more market. Coherent with this way of thinking, any country – better said, the corporations behind the governments – are afraid that accepting environmental regulations means losing their competitive advantages over their competitors, or, in the case of the governments of developing countries, the fear of not receiving external resources described by many of them as “compensation”, “foreign investment” (natural resource extracting corporations with greenhouse gas emissions) as a right in the face of “imperialism”. The “waves” of the Paris Accords move us “surfing” the big polluters that appear as the saviors of the planet and as the financiers of developing countries to adapt to climate change. The “undertow” is that the developing countries will be those most affected yet by the Paris Accords themselves, they will have to sacrifice the type of future (road to industrialization) that they have been seeking, emulating the developed countries; while the developed countries will follow their path of progress with GHG emissions. The second myth, that the problems created by capitalism are the responsibility of all of humanity, or that climate change is the responsibility of all. Moore (2015) describes this myth as coming “from a racist, Eurocentric and patriarchal vision.” There are historical responsibilities in the face of climate change, injustice that is hidden by the Paris Accords. It is not so much about “compensation”, as about getting the capitalist system to quit feeding itself from what nature produces, cheap labor, cheap energy, food and raw materials, quit persisting based on human and environmental genocide. At this point the biggest danger is that the Paris Accords become a door to dispossession, commercializing nature, in a context where the opportunities for appropriating the free work of forests, oceans, the climate and soils are less and less available. So in line with Moore (2015), looking at the reality without separating the economic from the ecological, as the history of the emergence of capitalism shows, and as we see in the dry zones in Central and South America, opens up new windows for understanding the reality, combining climate change and race and gender inequality. This step, in turn, will allow us to form new alliances among producer organizations, feminist organizations, worker and student organizations. Before continuing, let us recapitulate what has been worked on so far in the light of the proposed theoretical framework. The climate is a collective good, whose “over-exploitation” is due to the opportunism (free riding) of mostly large corporations and developed countries who have polluted the atmosphere. This fact has been sustained not only for 200 years (industrial revolution), but for more than 500 years under the emergence and establishment of the capitalist system on the basis of cheap labor from nature and most of the world´s population, which has also led to the institutionalization of a exclusive organizational pattern. These structures have been expressed in ideas based on market fundamentalism, in the belief that there is no alternative, and with “undertow” effects. This perspective has generated a pessimistic and conservative thesis, that the causes of the problem will be difficult to change, and that there is no greater human effort capable of making them change; it is pessimistic in the sense that, if it ends up true, the planet will become less inhabitable in the second half of the current century. And it is conservative in so far as it generates impotence, that there is not much to do, that the problem is so complex that we do not know what to do. Nevertheless, distinguishing the structural factors, supported by a historical perspective, allows envisioning a more optimistic thesis for institutional change, a new and more transformational correlation of forces. This is a “society in movement” with global awareness – for pressuring, and also with decisions about, for example, reducing their consumption of meat, milk and energy – to understand the social, economic and ecological reality as parts of the same process, connected to the families of small producers (peasants and indigenous) with intelligent sustainable practices in the efficient use of soil and forestry, with the relaunching of a business sector around new technologies for change in the energy matrix, with scientists committed to making renewable energies be cheaper than energy coming from coal, gas and oil, and with governments that promote appropriate fiscal regulations to incentivize renewable energy and – following Pickety (2015)– applying taxes on the richest in the developed countries as well as the developing countries, overcoming the traditional north-south dualism. This correlation of forces could make the old and dominant correlation of forces led by corporations to step back, and would be a window of possibilities for social, political, economic and ecological transformation of our societies and its institutions on this planet earth. Under this framework, we list three challenges in what follows. The first challenge is providing solutions that make the Paris Accords possible with a perspective that in the long term would allow fuel to stay underground. It is clear that it has taken a lot of time to reach these accords, the current goals are insufficient to save the planet, and the way that they propose to reduce CO2 is with a productivist and “green economy” vision. To introduce policies and decisions that would make the Paris Accords possible, it is important to understand the economic crisis, the social crisis and the ecological crisis as the crisis of capitalism; in doing so, replacing the economic fundamentalism in which we are trapped by a more holistic perspective of life. Without getting out of this trap, even solutions like clean energy (solar, geothermal, wind and others) will not prosper; likewise the critical perspectives of the member governments of ALBA countries, that with or without their own resources, continue without moving beyond economic fundamentalism. The second challenge is preventing capitalism from using the Paris Accords as an open door to accumulate more based on its historical practice of appropriating nature and cheap labor. Part of that reality we have seen in the policies on protected areas in Latin America, as well as in many cases of titling indigenous territories, that have worked to dispossess the indigenous and Afro-descendent populations and peasant families of their lands. And part of that modality is giving crumbs to the developing countries as a license to continue generating GHG, crumbs that are tied to mechanisms of “management by results” out of an individualistic logic (e.g. 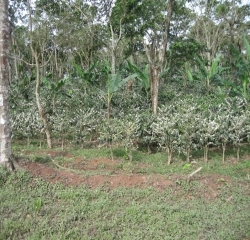 given to the individual producer for planting trees on his farm), and eroding organizational expressions (cooperatives, associations and communal organizations) that especially rural societies have for resisting the dispossession mechanisms of large enterprises that are always ready to buy their land. This is a form of dispossession that is unfavorable not only to the developing countries, but to 80% of the world population that only has access to 17.2% of world income. The third challenge is overcoming the nature/society dualism of the very actors historically considered “natural”, the peasant, indigenous and Afro-descendent families. The issue of climate change tends to appear as something very complex that leaves people with a sense of impotency, making them feel that human actions for change are so small in the face of something as large as climate change; and that ideological and slanted “campaign” on climate change has made indigenous and peasant families tend to “blame themselves” for climate change, something contrary to what is indicated in Graph 7. That degree of complexity and insecurity that climate change generates, combined with self blame on the part of the peasant famiilies, can be counterproductive. Confronting this situation requires that we get beyond the idea that development can only be achieved by way of industrialization, showing that the peasant, indigenous and Afro-descendent way, a path of centuries of resistance to capitalism, in alliance with different actors, can mitigate climate change, and within it, the role for agriculture and forestry for absorbing GHG, mentioned previously, make the world see the importance of this peasant and indigenous social sector. How can we take up the challenges and mitigate climate change? The diversification strategies of these families, with their different variations (see Mendoza, 2004), opposed to the mono-cropping system and extractivism, and including family and territorial organization with an emphasis on life connected to the land, are differentiating angles and practices for mitigating climate change. From this perspective of diversity, territories, diversification, organization and connection to the land, and opposed to the technopols identified by Robinson (2003), we propose the construction of a “epistemic community” that, in the words of Marchetti (2015: 20), is an “continuous and more profound encounter of different ways of knowing, crossing over educational and geographical aspects, abandoning external prescriptions, the external canon of science and even the external canon of politics on climate-energy, and taking responsibility to formulate and adjust policies every year in different geographies and epistemic communities”. How can these epistemic communities be constructed? We respond to this question out of our involvement in work with rural organizations. First, leaders of peasant, indigenous and Afro-descendent organizations would organize their knowledge in a systematic and ongoing way, and do it in alliance with intellectuals of the south and the north; building a long term capacity that would expand, correct, generate and catalyze knowledge, leaving behind oral tradition and only being reactive movements in response to the extractivism and monocropping. The solutions for making the Paris Accords possible would come from this type of processes that develop long term capacities. Second, their own capacity can be combined with experimentation and innovation processes of paths with different perspectives, and to the extent that their organizations consolidate based fundamentally on their own resources, and on resources generated by carbon capture. The PSA initiatives should be read in the light of this endogenous capacity, the practices of diversification, the logic of the territories where the population is taking care of the land, and the grassroots organizations that are expanding their management capacities of common goods. It is a matter of the families and populations being able to see climate change from their own lives, organizations and communities, mitigating climate change, instead of seeing themselves as minuscule beings in the face of “complex” and “uncertain” climate change, as isolated individuals enmeshed in abstract markets. Third, with this capacity of producing knowledge and innovating forms of climate change mitigation as a different way of life, implying personal changes and organizational renovation, the peasant, indigenous and Afro-descendent families need to reconquer land areas, deepening their relationship with the land, expanding their territories as “the place of those who take care of the land” under the premise that ecological, social and economic equity are inseparable, and that therefore gender, ethnic and generational inequality are parts of environmental degradation. Within this process, the state and organizational policies to mitigate climate change should respond to this perspective with crop rotation, diversification, the rollback of the mono-cropping system and extractivism, and social and economic equity. In this way that coordination of practices and policies will be the basis so that the Paris Accords are carried out and deepened to achieve a global warming goal of less than 1.5 0C, innovative ecological, social and economic practices are promoted, poverty and inequality are reduced, which is coherent with the Sustainable Development Objectives, not leaving even one poor person behind by 2030. In conclusion, the poem quoted at the beginning of the text is from the Sàmi indigenous people, located in Norway, Switzerland, Finland and Russia, a people who are fighting to have their lands recognized. They remind us that even though we speak the language of the earth, that the key is connecting to the earth again and learning to relate to her. J. Laiti of the Sámi people states that recognizing that we belong to one another leads us to love life, use nature as the source of life, and convince ourselves that we live in – and we are made of – the earth. This change of relationship with nature is possible if there are personal changes and organization renovation, as Pope Francis reminds us in his Encyclical Laudato Sí: “there will not be a new relationship with nature without a new human being.” And with these two steps, to take the third, following the African Proverb, “if you want to go quickly, go alone; if you want to go far, go accompanied.” In the face of the systematic harassment of corporations (market), the construction of epistemic communities with peasant families and indigenous and Afro-descendent peoples, groups that haver persisted this harassment for centuries, now developing their capacities for organizing and producing their knowledge and innovations, a process accompanied by a framework of global alliances, and by ongoing personal change, can really make a difference in mitigating climate change. This can get the best of the “undertow”. This is moving far ahead. * René Mendoza (rmvidaurre@gmail.com) has a PhD in development studies, is a collaborator of the Winds of Peace Foundation (WPF) (http://peacewinds.org/research/), associate researcher of IOB-University of Antwerp (Belgium). This work has benefitted from the comments and suggestions of P. Marchetti, F. Huybrechs, G. Delmelle, K. Kuhnekath, D. Kaimowitz, J. Bastiaensen and T. De Herdt, as well as the reflections expressed in a workshop with leaders of rural organizations (cooperatives and associations), and representatives of organizations both inside and outside the country. Olson, M., 1965, The Logic of the Collective Action. USA: Harvard University Press. The following scientific study talks about the fact that sea levels could rise more than 5 meters and affect cities like London, Miami, Shanghai and New York. Hansen, J., Sato, M., Hearty, P., Ruedy, R., Kelley, M., Masson-Delmotte, V., Russell, G., Tselioudis, G., Cao, J., Rignot, E., Velicogna, I., Kandiano, E., von Schuckmann, K., Kharecha, P., Legrande, A.N., Bauer, M., y Lo, K. W., 2015, “Ice melt, sea level rise and superstorms: evidence from paleoclimate data, climate modeling, and modern observations that 2 _C global warming is highly dangerous” en: Atmos. Chem. Phys. Discuss., 15. P. Oquist (see: https://www.youtube.com/watch?v=uL53JDkek2g) justified the fact that Nicaragua had not turned it in: that the United Nations, in terms of climate change, does not have objective verification mechanisms for the expression of the individual will of the different countries; and because Nicaragua has low emissions and in addition is reducing it – in 2014 it only emitted 0.03% of gases, and that because of the increase in renewable energy (from 25 to 52%) the country saved 2.1 million tons of CO2, with which total gas emissions dropped to 4.8 million tons. This financing had already beeen approved in 2011 as the Green Climate Fund (GCF), as a financing mechanism of the United Nations Framework Convention on Climate Change (UNFCCC). See: http://finanzascarbono.org/financiamiento-climatico/canales-bilaterales-de-financiamiento/fondo-verde-para-el-clima/ The Paris Accord ratified this agreement. To read the chronology on climate change, see: http://www.un.org/climatechange/es/hacia-un-acuerdo-sobre-el-clima/ For a historical review of the “wave” (Paris Accords) and particularly the day to day of the Paris negotiations, see: Campos, V., 2016, “The Paris climate agreement is patently insufficient” in: Envio 415. Verbruggen, A., 2015, Self-governance in global climate policy: An essay. University of Antwerp. The 1997 Kyoto protocol legally linked the developed countries to the emission reduction objectives. It set goals for greenhouse gas reductions of 5%. The commitment period was 2008-2012, and 2013-2020. Only 37 countries (28 in Europe) signed this accord. The US Congress did not ratify it, and countries like China, one of the countries with the most emissions, were left out. By 2015 the 37 signature countries were able to reduce emissions by 22%. Correa, R., 2015, “Por el hermano viento, por el aire, la nube, el cielo sereno y todo tiempo” in: Correos 7.42 Nicaragua: Instituto de comunicación Social. See: https://www.youtube.com/watch?v=uL53JDkek2g. For more reading on the proposal of the Government of Nicaragua published before the Paris Summit, see: Oquist, P., 2015, “La posición de Nicaragua” in: Correos 7.42. Nicaragua: Instituto de comunicación Social. Van Hecken, G., Bastiaensen, J. y Huybrechs, F., 2015 (“What’s in a name? Epistemic perspectives and Payments for Ecosystem Services policies in Nicaragua” in: Geoforum 63) discuss “epistemic circulation” to explain how the member countries of ALBA (Bolivarian Alternative) deal with conservationist environmental policies and then end up joining it. The authors observe in the case of Nicaragua how, in spite of the critical perspective of the government on the payment for environmental services (PSA), most of the PSA projects in the country have been carried out responding to the dominant perspective of being governed by the market. Moore, J. W., 2015, capitalism in the Web of life, United States: VersoBook. The dispossession is done not just by the extractive companies and monocropping enterprises, but also the institutions that started as alternatives. 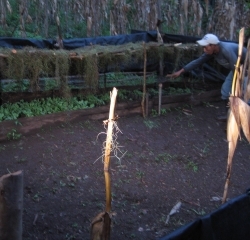 For example, many microfinance institutions present their portfolios as “green loans”, which by financing extensive livestock raising, instead contribute to this dispossession of land and territories; these same microfinance organizations do not give loans to indigenous populations nor to peasant families that are diversifying their production, and that are located in protected areas and indigenous territories, or cooperatives that have forest areas and that are prevented from touching even one tree. For a critical perspective, see: Chambers, R., 2014, “Perverse Payment by Results: frogs in a pot and straitjackets for obstacle courses” in: IDS, Sussex University. 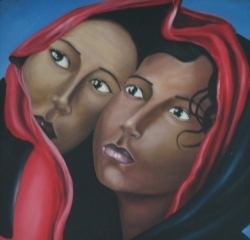 This phrase from women of the Afro-descendent community of La Toma del Cauca (Colombia), was picked up by Escobar (2016), “Desde abajo, por la izquierda y con la Tierra” in: Contrapuntos, Serie Desafíos Latinoamericano 7. It’s an exciting time for many in this country, with the first visit of Pope Francis to the U.S. Some 70 million U.S. Catholics notwithstanding, it’s remarkable to see and to feel the excitement generated by this pope. Catholics and non-Catholics alike have been mesmerized by the rock star quality of this man and, more notably, of his message about taking care of each other and the planet. It’s a moment to savor, this feel-good visit from someone who has the capacity to generate an upbeat and hopeful message; not many could do it. But it also creates a disconnect for us, as we cheer the messenger while simultaneously spurning the message. Like many, I have watched copious news coverage of the papal visit, out of interest and curiosity. I’m both interested in hearing the topics that Francis has chosen to highlight and curious about our collective and positive reaction to him and “the higher Chief” to whom Francis reports. But I wonder about the gap that exists there, one that Francis has referenced on several occasions in his talks here. That distance between the emotional uplift of this man’s visit and the reality of our daily actions is wide, and I am confounded by that space. How is it possible that we can be so emotionally and spiritually attuned to the lessons Francis brings, while at the same time living our lives deaf to our own opportunities to respond? Matters of climate and environment, poverty and hunger, stewardship and servanthood have seemingly captivated the pope’s audiences around the world- now including the U.S.- at a time when the debate rhetoric around such issues has never been more polarized and heated. And we are all the same in this spiritual conundrum that afflicts us between our feeling and our doing. Catholics from Latin America are especially in love with Francis, for he is “of them” and speaks to Latin Americans in their own language, a connection which is treasured. From country to country Francis is welcomed by heads of state who cherish the moments of being in the presence of the pope and his hopeful message, only to return all-too-frequently to their autocratic regimes of favoritism, exclusion and oppression. Even in the rural reaches, professors of the faith who hold a very proprietary view of Francis and his humble servanthood will too often seek to take advantage of opportunities for gain over good character. We are seemingly infected with the virus of selfhood. In Europe, the pontiff is received upon red carpets and with gifts of expressive love by leaders who, in some cases, have slammed shut the doors of receptive love on the very homeless about whom the pope continually reminds us. Particularly on the European continent, we are afflicted with the disease of short memory about dispossession and relocation. In the U.S., political leaders have clamored to be among those in audience with the pope; few were absent as Francis addressed Congress. Yet some of these eager faces will reflect a far different countenance in the days to come as the country weighs national interests of short-term corporate health against interests of long-term personal, national and global well-being, of political postures versus strength of character, of support for military revolutions in contrast to Francis’ “revolution of tenderness and love.” Here, we are seemingly diseased through our affluence and power. The observations and questions posed here are not intended to be accusatory or pejorative to anyone other than perhaps myself. To be sure, we are complex beings with internally competing motives that shape us day by day, even hour-by-hour. We are human, imperfect by definition. We cannot be perfectly consistent because we live in dynamic surroundings, some physical, some emotional, some spiritual. We are subject to awesome and unexpected changes to our lives, alterations which can be both unanticipated and unexplainable. Our world is transforming every day, in ways seen and unseen to most of us. But almost despite those realities, Pope Francis has been able to reach out to the world with a message that has caught us off-guard but which is full of possibilities. The receptivity to that message does not depend entirely in the voice of the deliverer, but in the hearts and minds of the rest of us. Francis has asked us to be our best selves. Consistency between that ideal and our daily actions is entirely within our command. Deep down, that’s why we’re so glad the pope is here, sharing his universal words of humility and hope, and why we long to embrace both him and his message….